Fingal Bay, owned by Roger and Carol Skan, justified 9/2 favouritism in a thrilling finish to the Pertemps Network Final at Cheltenham . The Philip Hobbs-trained eight-year-old got his head in front on the line to deny runner-up Southfield Theatre by a nose but jockey Richard Johnson thought he may have not have won the race when he watched the replay on the big screen. "I thought we'd won as we crossed the line but when I looked up and watched the replay, I wasn't so sure," said Johnson. "He is an amazing horse and we have always thought the world of him. He had an injury last year but he has come back - Philip and the owners have given him every chance to recover and they have been well-rewarded today. "I didn't want to be in the front too long but, when I popped him, he is just such a trier - he is like the horse yesterday. I have definitely got luck on my side at the moment. I have been very lucky over the two days. They are two very, very good horses and it's amazing for me. "Daryl (Jacob - jockey of the runner-up Southfield Theatre) is devastated but it is a very fine line between winning and losing. We all work together everyday of the week, just about all year round, and this Festival means so much to us. To have a winner a winner is amazing and it's almost harder to get beaten that far than finish further down the field. I am just very, very lucky." Hobbs also admitted to being a bit nervous as they awaited the result of the photo-finish. "That one was even tighter than yesterday (when Balthazar King won by a short-head in a photo-finish to the Glenfarclas Cross Country Chase)," said the trainer. "I suppose he would have won easily but for missing the last and he was probably in front a bit long. "He was very good right from the word go. 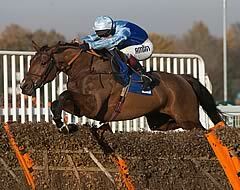 He won his very first bumper and he is one of very few horses to have beaten Simonsig at Sandown. He had a long time off but it is great to come back and win this. "He is just as good as ever at home and the handicapper let him down a bit. He was 148 today but it wasn't too bad for a Grade One winner." One and a half pixels separated Fingal Bay and runner-up Southfield Theatre in a tight finish. The official distance was a nose, a disappointment for the runner-up's trainer, Paul Nicholls, who said: "It's frustrating - we knew we had a good chance and Daryl thought he held on. How can you split it? Whatever happens he is a good one to take chasing next season." Channel 4 cameras caught Jacob looking flabbergasted and then disappointed, with the jockey holding his head in his hands, while the winning rider Richard Johnson tried to console him. Pineau De Re finished fast to take third, a neck behind the runner-up, and his next target will be the Crabbie's Grand National - he is number 49 in the list for that race so should get a run. His trainer, Dr Richard Newland, said: "I'm thrilled to bits with him - he ran a blinder and was arguably unlucky because he missed the last or might have been even closer. If he comes out of the race all right, he will go for the [Crabbie's] Grand National. "He's a great traveller, but when he came off the bridle today he finished really well, too. He doesn't always find that much, but today he stayed on really resolutely and that was very encouraging for Aintree over four and a half miles. "It was in my mind to run him in a hurdle race before Aintree because he ran a very good race over hurdles here last year - I could have run him in a veterans' chase at Newbury a week or two ago, but thought he was more likely to come out in one piece if he ran in this, and I thought he had a squeak, too."